I am an enigma; I am us. I describe myself as an electrician and electrical contractor. But no, I can not be both. According to the universally accepted authority on such things, Wikipedia, an electrician is an entirely different creature than an electrical contractor. They say “An electrical contractor is different from an electrician; an electrician is an individual tradesman and an electrical contractor is a business person or company that employs electricians. Both usually hold licenses and insurances to properly and safely operate a business…” I feel like I meet both description, but Wikipedia will have none of that. So, according to Wikipedia, I am one or the other. I can not be both. The fact that I am the owner of Goodiel Electric, LLC, a Jensen Beach electrical contracting company, must then make me an electrical contractor. That seem reasonable to me, but not to other authorities. In fact, the search engine giant Google.com claims that the business, Goodiel Electric, LLC, can not categorize itself as an electrical contractor, but will allow it to categorize itself as an electrician. They say “Categories describe what your business is, not what it does or what it sells.” Their system will allow Goodiel Electric, LLC. to be categorized as “electrician” or “contractor”, but not as an “electrical contractor” Their system will not except “electrical contractor” as a business category. My solution to that was to list Goodiel Electric, LLC. as “electrician” and “contractor.” Google.com was perfectly happy with that, as was I. The strange thing about Google’s obsession in this instance is that now a search on the phrase “Jensen Beach Electrical Contractor” produces a Google Places listing for Goodiel Electric, LLC. I can live with the first page listing as a Jensen Beach electrical contractor, but their map technology definitely needs attention. I live in Jensen Beach, but their map shows as an address West of interstate 95. Unbelievable! For a Great Deal, call Goodiel Electric. 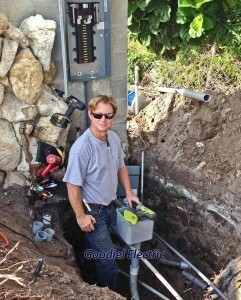 Master Electrician and Martin County Florida based Electrical Contractor In Martin County, Goodiel Electric, LLC. services Hobe Sound, Indiantown, Jensen Beach, Jupiter Island, North River Shores, Ocean Breeze Park, Palm City, Port Salerno, Rio, Sewalls Point and Stuart, Florida. In St. Lucie County, Goodiel Electric, LLC. services Port St. Lucie, St. Lucie West, Tradition, Torino, Tesoro, Lake Charles, Lake Forest, Magnolia Lakes, PGA Village, The Vineyards, St James Golf Club, The Cascades, Fort Pierce, and the unincorporated areas of St. Lucie County, Florida. I highly recommend Goodiel Electric. Glenn is professional, on time, and does good clean electrical work at a fair price. As an owner of a Home Management and Real Estate Company… it is important to have someone reliable, responsible and someone who shows up when scheduled. My customers depend on me and I depend on my service providers. I have been using Glen since I started my business and have found Glen to be dependable and honest. I recommend him to my customers. As a tiling contractor, working in Port St. Lucie, I have had the pleasure of working on projects where Glenn Goodiel was also at work. He was conscientious in his work and courteous enough to take care not to damage my work in progress. That courtesy was much appreciated. The end result was that the homeowner got quality workmanship from both his electrician and tiling contractor. A win-win for all involved. Found Goodiel Electric on Craigslist. Glenn showed up at scheduled time for job. Work was done in a professional/prompt manner and looking clean when completed. We will be using him in future when the need arises. Thanks! We highly recommend Glen as an electrician who comes with short notice vs. the usual electrical local company which tells you that maybe they could fit you into their schedule in 3 weeks! He took care of our needs efficiently and expertly. We have had him return to do other electrical items. We cannot recommend him more. He is dependable and fits each customer into his schedule very promptly. Without a doubt, he is our “go to” electrician.